Are Californians forking over too much green for green energy? A new report from a ratepayers advocacy group found that the price of electricity in 59 percent of renewable energy contracts signed by the state’s three big utilities exceeded the market price referent, or MPR for all you utility junkies. Without getting into the nitty-gritty regulatory calculus, the market price referent is based on the price of electricity from a 500-megawatt natural gas-fired plant, the dominant power source in California. The MPR is a benchmark to gauge the competitiveness of solar power plants, wind farms and other renewable energy projects. 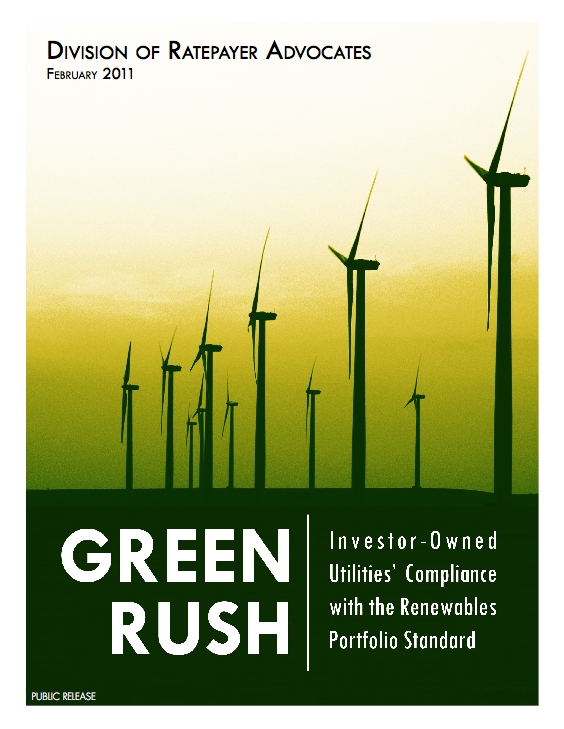 The “Green Rush” report from the Division of Ratepayer Advocates, which is part of the California Public Utilities Commission, generated headlines in a state that loves to hate its monopoly power providers. But a closer look shows that the reality is a bit more complicated. The ratepayers advocate looked at contracts signed by California’s three big investor-owned utilities – which supply 68 percent of the state’s electricity – since the Legislature imposed a renewable portfolio standard, or RPS, in 2002. The RPS required utilities to obtain 20 percent of their electricity supplies from renewable sources by 2010 and 33 percent by 2020. According to the report, 77 percent of the contracts signed by Pacific Gas & Electric were above the MPR as were 41 percent of those inked by Southern California Edison and 47 percent of deals with San Diego Gas & Electric. Regulators keep the terms of those contracts in a black box so it’s impossible to know just how much more utilities are paying for renewable energy. Most contacts are for solar power. However, not a dime gets paid until a project comes online and begins generating electricity. So, PG&E may well have agreed to exorbitant rates in a contract it signed in 2009 with a company planning to beam solar energy from space generated by an orbiting power plant (really). But unless those rockets lift off with their payloads of solar panels, the ratepayers are off the hook. According to the report 14 percent of renewable energy contracts have failed so far and 15 percent have been delayed. Since 2002, photovoltaic module prices have plunged and as some projects are scrapped they inevitably will be replaced by cheaper technology. In December, for instance, Southern California Edison abruptly canceled a longstanding contact with Tessera Solar for the 663.5-megawatt Calico solar dish power plant to be built in the Mojave Desert. A week later, Tessera sold the project to K Road Power, a New York firm that says it will replace most of the solar dishes, which have never been commercially deployed, with tried-and-true solar panels like those found on home rooftops. And this month, Tessera sold a second big solar dish project, the 709-megawatt Imperial Valley power plant, to AES Solar, which builds photovoltaic farms. Solar module prices have fallen 50 percent over the past two years and it’s probably no coincidence that utilities increasingly are signing big deals for photovoltaic power plants. When Southern California Edison this month submitted for approval contracts for 20 small photovoltaic farms that would generate 250 megawatts of electricity, all were priced under the MPR. A word about the MPR: It’s somewhat a theoretical construct as it assumes fuel prices are fixed for the life of the power plant. Natural gas prices, of course, fluctuate wildly and currently are headed down. In a of couple years, who knows? The MPR also does not take into account the cost of carbon that may be imposed on greenhouse gas-spewing power plants in the years to come. The ratepayers advocate, however, is justified in arguing for more transparency in the approval of these renewable energy contracts. Opening up that black box and letting in some sunshine just might spur more competition for solar contracts.